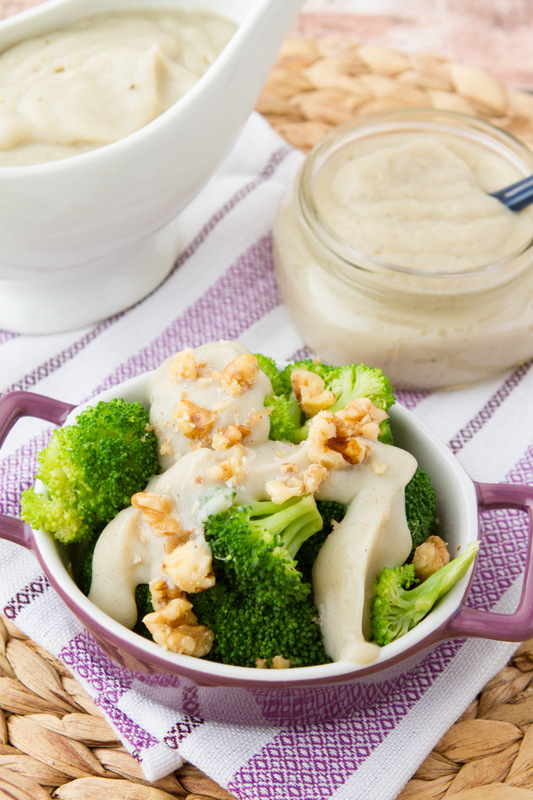 This dairy-free cream sauce is the answer to your recipe woes. You can spread it, bake it, pour it and drizzle it just like any other creamy sauce out there. The kicker? It’s dairy-free, grain-free, paleo, vegan and made with vegetables! Add cauliflower, garlic and broth to pot. Cover and bring to boil. Reduce heat to simmer and cook for 20 minutes. Add remaining ingredients with 1/3 cup reserved liquid to your high-powered blender. Blend on high for 30 seconds, until very smooth. Add to any recipe that calls for creamed soup or drizzle on vegetables, chicken, pulses, grain bowls, whatever! Can be frozen for up to 3 months. Keeps well in the fridge for 3-4 days. Broth/stock – Vegetable broth is best here, but homemade chicken broth in this recipe is also really good!